Spacious and comfortable studio. Fabulous views from the balcony towards Dona Ana and the sea, and only a few steps to the beach. Bright and spacious apartment with 2 bedrooms and 2 bathrooms located on a complex with 2 swimming pools in historic Lagos (western Algarve). Close to several beaches and the walled centre of Lagos. Two-bedroom apartment with jaw-dropping sea view, directly above Dona Ana beach. two-bedroom apartment with large patio and jaw-dropping sea view, directly above Dona Ana beach. Large 3-bedroom apartment with small private garden directly above Dona Ana beach. 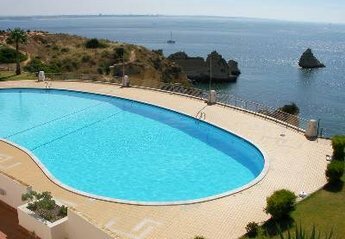 Private, apartment, located just a 15 minutes walk to one of the greatest beaches in Lagos, Portugal. 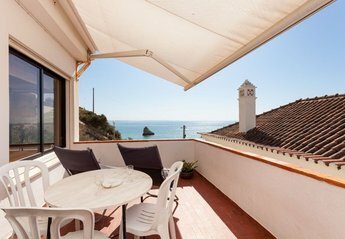 Gorgeous private apartment, more like a semi-detached little house overlooking the sea. Ideally situated to enjoy all the facilities of the wonderful resort of Lagos on the Western Algarve. A two bedroom apartment, well furnished. Situated in an atractiv and quiet area, about 15 min. walking to the beach and town centre. Our vacation home is located in a holiday resort in Lagos. It offers a reception, a restaurant and 2 community pools for adults and 2 children’s pools.